I found it hard to decide on the theme for May. I had a lot of good ideas and I just couldn't choose which one I liked the best. In the end I went ahead with a light, love and lots of light bulbs theme! I just got inspired by a quote I saw on Pinterest, which I've actually used in one of my layouts as you'll see later on. It says 'Let Your Light Shine', and it really affected me when I read it. So, I wanted to incorporate it in my May's theme. For my cover page I decided to have a two page spread this month. On the first page I have the month with a little calendar and a single light bulb. As you can see, the colour palette I chose for this month has pinks, greys and black and white shades. I decided to not go for the traditional yellow shades that you normally associate with light. And I have to say that I love the way it turned out. At the end of the post I always add all the supplies I used to create my layouts, so make sure to check it out. The theme continues into my Monthly Spread. Again I used the separate boxes for this layout, and I've added lots of light bulbs with notes and signs to match with the theme. I LOVE the black numbers in the boxes, and I think this is one of my favourite pages for this month!!! Again I'm separating my monthly goals into two sections: personal and business. Sitting down and writing all the things I want to focus on during the month in these two categories has proven very productive. It helps me clear my head and narrow down the things that I want to achieve each month. The next page is my monthly focus. I've started using this spread in March and it has become a staple in my monthly set up since then. I found it in 'Your Best Year 2018' by Lisa Jacobs and decided to added it in my bullet journal. These are my monthly objectives summarised in 5 categories that include Financial, Spiritual, Mental, Physical and Relational. These are the five pillars of a harmonic life, as taught in 'Harmonic Wealth: The Secret of attracting the life you want' by James Arthur Ray. And on this page you basically write what you want to improve during this month in each of those categories. It's just another way to help you focus more on specific areas of your life in order to move forward and make changes. So, together with my monthly goals page they set up my intentions for each month. Moving forward, this is my areas of focus / tasks to complete spread. It is the next step of my monthly focus and planning. One more spread inspired by 'Your Best Year 2018'. 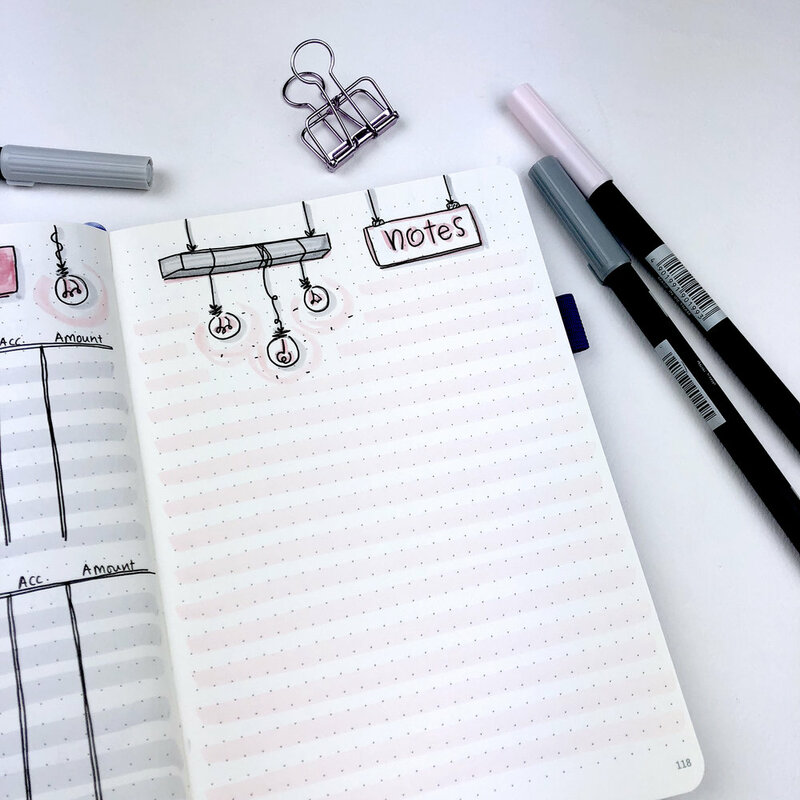 It helps you to organise your thoughts and what you have to do during the month and turn your plans into actionable steps. On the left hand page is the areas of focus, where I write everything I want to do during May. To create this list, I look at the previous two spreads. Then I take it a step further and I write all the steps I need to take for each goal, in order for everything to be done. After that, I take those steps and I spread them as the tasks that need to be completed in the 4 weeks of the month. That way, I know exactly what I need to do each week in order to have a successful month, so that I will finish all my projects and tick off all the things from my to-do list. Next comes my monthly finances spread. It's a basic spread for my blog/work income and my expenses. It's become a habit to track my finances, so this spread is a constant for each month. As always I keep a notes page in my monthly layout. I think every one should have a page like that in their monthly setup. It's such a useful page, that keeps all my random thoughts and notes in one place. As someone corrected me in last month's plan with me post, this is my 'two lines per day' spread (and not 'one line per day'). It is a spread that I use like a journal - it could be a thought, it could be something that happened during that day, a quote I liked or anything else I want to remember about that particular day. So, instead of having different spreads for gratitude, journaling and so on, I only have this. I enjoy so much filling in this spread each day! And I love coming back at the end of the month to read all the things I've written. And lastly, but not least, this is my first weekly spread for May. I used a very simple layout and I've added lots of light bulbs to decorate it. I find that I prefer vertical layouts for my weekly spreads instead of horizontal. So, I've found a few that work for me and I rotate them for the 4 weeks of each month.